Shahid Naeem had a bad feeling. The third year political science major, who has served as the Vassar Student Association (VSA) 2016-17 Chair of Finance, had a gnawing suspicion all year that the VSA budget didn’t quite add up. “Something didn’t seem right to me,” he said. So a few weeks ago, Naeem sat down with VSA advisor and Associate Director of Campus Activities Michelle Ransom to run the numbers and try to figure out exactly what was going on. It turned out that his hunch was correct. Something was, indeed, very wrong: The VSA had a deficit of at least $150,000. “When I walked out of this meeting, I came to terms with the fact that none of these numbers [that had been bothering me] were mistakes,” Naeem recalled, adding, “I just felt really tired.” For her part, Ransom wasn’t shocked. “I’ve worked here for 24 years, so not much surprises me,” she said. The situation, which Naeem described as a “perfect storm,” required immediate action. On April 4, he announced that until further notice, all VSA Special Purpose Funds would be frozen. The exact reasons for the six-figure budget discrepancy are manifold and are still being worked out. The precise amount of debt is not yet known. What is known, however, is that one of the largest contributing factors to the deficit was the disparity between the amount of student activities fees the VSA expected to collect and the amount that actually came in. Student activities fees—which are currently $350 a year, per student—are part of the cost of attendance at Vassar and make up the VSA budget. Much of this money is allocated for campus events and about 180 student organizations, commonly known as orgs. The VSA budgeted $917,000 for the 2016-17 school year, but because of a fundamental flaw in the way this budget was calculated, the actual revenue collected was much less than expected. This is due to the fact that there are two groups of students who don’t actually pay the student activities fee. The first group includes students who transfer, drop out or decide not to attend during the summer before their first year, whose money is refunded if they withdraw early enough. The second group is made up of students studying abroad who don’t pay this fee for the semester or year they are away from the Vassar campus. Unfortunately, for several years now, the VSA has failed to take these factors into account when it creates its budget for the following year, according to Naeem. As a result, the VSA collected only $834,000 in student activities fees this year—$83,000 less than it had budgeted for. What’s more, the way that org budgets are allocated doesn’t match up with the way student activities fees are actually collected—namely, that students pay by semester, not by school year. So when the VSA convenes at the beginning of the fall semester, it has only half of the money it needs for the full year. “If you start day one with an account that’s at negative $500,000 [due to paying out the entire annual budget before the spring semester fees come in], and that’s standard practice, what do you think your conception of debt is? You don’t have a conception of debt,” Naeem remarked. Additionally, according to Naeem, there’s no precedent for breaking down the org budgets by semester. That’s because many of them spend vastly different amounts at different times of the year, particularly if they’re hosting a major event during one semester but not the other. “The spending’s not symmetrical [from one semester to the next],” Naeem explained. In the current system, annual org budgets are set in May, and the VSA pays out those funds at the beginning of the next school year, even though it doesn’t actually have all of that money yet. This would be less of an issue if the overall VSA budget took into account the students who don’t end up paying the student activities fee. Then the money spent prematurely in the fall would be reimbursed by the fees paid for the spring semester, and the annual budget would balance out. Because the VSA has historically overlooked the non-payers of the activities fee, if it gives out an average of $900,000 at the start of each year but only collects $410,000 in fees each semester, it will have an $80,000 deficit by the spring semester. And that deficit will then roll over to the following year. If the same mistake is made again, that $80,000 deficit grows into a $160,000 deficit, and so on. Another huge problem is this: Each year, the main VSA budget, internal VSA accounts and org budgets aren’t closed out. Instead, both surplus and debt roll over, year after year. This has allowed many orgs to unknowingly accumulate debt that grows with each passing year. “No matter what’s in your account, you [can continue spending] money,” said Naeem. The people running these accounts often had no idea they were even in debt, according to Naeem. Everyone across the board was told by the VSA and older org members that accounts that appeared to be in the red must be a mistake because they were still able to spend money from them. In an effort to rectify the problem and balance the budget, Naeem expects the VSA’s Special Purpose Funds to remain frozen until at least the end of this school year. These funds encompass the Collaboration Fund (which pays for events co-sponsored by dissimilar organizations), the Community Fund (for outreach and engagement with the Town and City of Poughkeepsie), the Conference Fund (to send students to off-campus events), the Speaker Fund (which pays for speakers, performers and panelists) and the Discretionary Fund (for miscellaneous funding requests). Though the Capital Fund (for nondisposable goods like baking sheets for cookie-making parties or microphones for performers) falls under the umbrella of Special Purpose Funds, it was not frozen because it had already been endowed. Similarly, since org budgets were all allocated months ago, they too remain unfrozen. Despite some bumps in the road, Naeem believes that the money from the Special Purpose Funds will be enough to fill the gaps in this year’s budget and put an end to continued debt accumulation. If it doesn’t, however, the remaining money will have to come out of the 2017-18 VSA budget. Next year, all campus orgs, regardless of whether they are in the red, are facing an average 14.5 percent budget cut, and the total budget, which was approved by the VSA Senate on April 30, will be much lower, at $734,000. Naeem is endeavoring to give his VSA Finance Chair successor, Robyn Lin ’18, a better hand than the one he was dealt when he took the position. “If she gets a blank slate, [Lin]’s going to be in a really good position to make sure this never happens again,” he said. But even if Lin isn’t burdened with the debts of previous years, she’s still facing a daunting task. Chair of Finance is an extraordinarily taxing role for a student to take on. While 2012-13 Vice President for Finance (the former position title) Alex Koren ’13 maintained that he received “substantial training,” more recently Chairs of Finance have received no special training from the College and are tasked with managing an annual budget of almost $1 million. Though the VSA has a Finance Committee that reviews funding applications and determines the yearly budget, many of the committee members hold other positions in the VSA. This year, Naeem is ultimately the only one responsible for running VSA Finance and doing all the day-to-day work that the position necessitates. It’s a full-time job—one that regularly requires him to put in 40- to 50-hour weeks, on top of attending classes and completing his schoolwork. Unlike all other VSA positions, which start in August and end in May, the Chair of Finance job lasts a full calendar year, beginning on July 1 and ending June 30 of the following year. The student holding the job isn’t required to stay on campus all summer, but they do have to work remotely, often on top of holding down a summer job or internship. And though it’s a paid workstudy position, Naeem had to put in so many hours that he had maxed out his work-study allotment by November. No one interviewed for this article seemed to know why or how long VSA Finance has been this way, but Associate Dean of the College Edward Pittman ’82 said that he remembers it being the same when he came back to work at Vassar in 1990. Ransom also recalls just one student being in charge of VSA accounting during the 24 years she’s been here. Compared to our peer institutions, Vassar’s VSA Chair of Finance position appears to be one of the most demanding of its kind. Many of the student treasurers and vice presidents of finance at the 11 highly-selective liberal arts colleges The Miscellany News reached out to for this article (Barnard, Bryn Mawr, Colby, Colgate, Hamilton, Middlebury, Mount Holyoke, Oberlin, Williams, Wellesley and Wesleyan) have similar responsibilities. But most commented that they have some oversight and training from their school, that they spend a fraction of the time that Naeem does on this job or that they’re managing only about half as much money. “I have a lot less responsibility than Vassar’s Chair of Finance,” said Oberlin Student Senate Treasurer Duncan Reid via email, after being briefed on the situation. The VSA didn’t always control such a large sum of money. Ten or 15 years ago, the annual VSA budget was more on par with our peer colleges: about $500,000. Before that, it was even less. 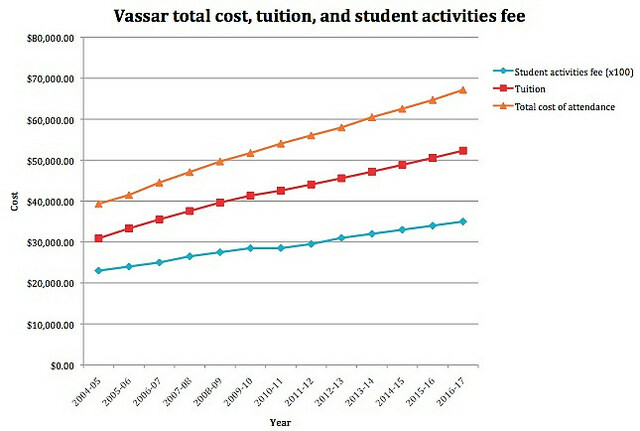 But each year, the student activities fees that make up the VSA budget have steadily increased, paralleling the rises in Vassar’s tuition and total cost of attendance. In the 12 years since the 2004-05 school year, when the fee was $230 per student, the amount has increased 52 percent, expanding the VSA budget by hundreds of thousands of dollars, even when adjusted for inflation. Though this does allow for better-funded orgs and more student-run events, most of those involved agree that it makes managing the VSA’s money a much more difficult job, and no changes have been made to the Chair of Finance position to reflect that fact. For his part, Naeem asserted that hiring help has been brought up before and that nothing’s ever come of it. Nor does he expect anything to come of it now. “It’s a good idea, but it’s not one that has any traction,” he said. “It’s definitely not going to happen next year, because there’s no team that’s been assembled to do it.” Lin agreed that she doesn’t foresee this happening. She added, “I’m not quite sure how much it would even alleviate from the job, because bookkeeping is just a small part of it, and it could be difficult if the bookkeeper doesn’t have context for what’s happening. Another possible fix that has been suggested is restructuring VSA Finance. The VSA has reorganized several positions over the past few years, but Naeem had to table Finance’s restructuring indefinitely once the debt came to light, since he didn’t have time to address both. Lin, however, is committed to seeing it through. “I hope [the restructuring of Finance] will end under me,” she said. Lin added that she would like to separate Chair of Finance into two positions: one responsible for working with administrators and taking care of paperwork, and one who would manage the Finance Committee and work with org treasurers. Amey commented that though the specifics of restructuring need to be discussed further, she does believe that changes—possibly including the addition of a co-chair—need to be made to VSA Finance. But while neither students nor administrators want to see the College seize control of the VSA budget, the involved parties all agree that the current situation is untenable. As time goes on, the student activities fee will continue to increase (it will be $360 next year), and overseeing this budget will become more and more unmanageable for just one student. “It’s pretty clear that something needs to change,” Naeem concluded. Excellent article, LAUREL HENNEN VIGIL. Well written, great understanding of the issue, and you name every source. 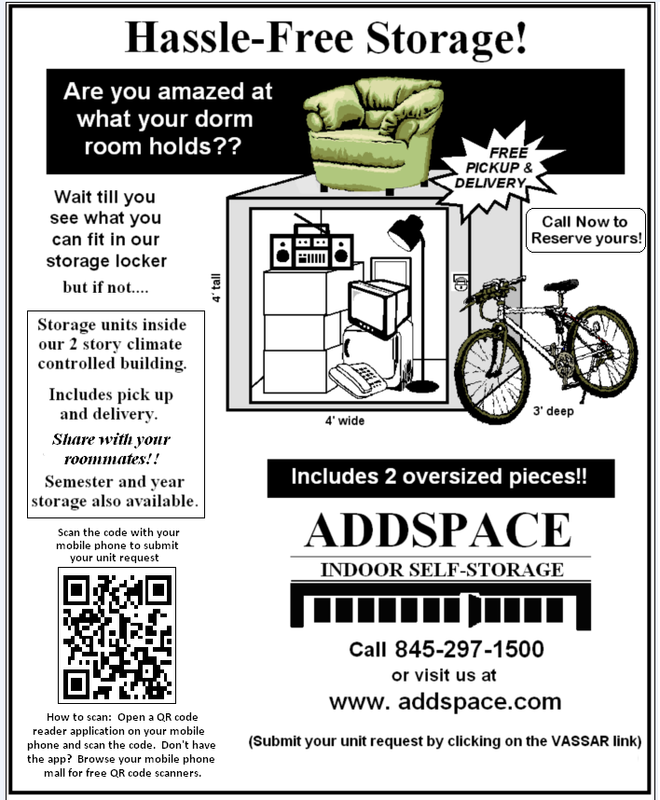 I see the VSA problem as a symptom of a greater problem at Vassar. Lack of real accountability, no consequences, and put-off-until-tomorrow attitude toward the responsibility of today. Thank you LAUREL HENNEN VIGIL. I look forward to reading you in the future. Keep up the good work. Agreed – a very thorough piece.